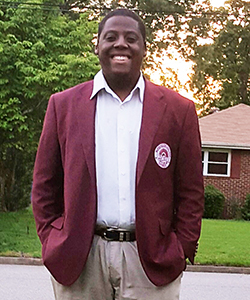 Morehouse College Stamps Scholar Da’Von Boyd plans to become a college professor and pass his passion for political science onto his students. Boyd has been interested in politics since he was a kid. He remembers voting in a mock 2000 election in elementary school. He grew up in Norfolk, Virginia and went to Granby High School where he was part of the debate and forensics teams as well as the Student Government Association, the Multicultural Awareness Club, Granby Go Green, and Model United Nations. He also volunteered at the Children’s Hospital of the King’s Daughters delivering toys to patients. He was drawn to Morehouse College because of its prestigious alumni, who include Martin Luther King Jr. and Julian Bond. He was interested in attending an institution that was considered to be an epicenter of black male excellence. The Stamps Scholarship was a deciding factor in his decision process. “I was excited about receiving the scholarship in the very first place, but I was even more excited about the opportunities that were going to come undoubtedly from having this scholarship opportunity presented to me,” he said. At Morehouse, he has continued debate and now has served as the team captain for two years. He enjoys the opportunities to do research, become a better leader and speaker, and build relationships. He won a national championship in 2014 as well as numerous regional and collegiate competitions in the past three years. He is also president of the Morehouse College Moot Court Team, a member of the Young Democrats, and the president of the Honors program. He enjoys the small size of the program and building a community for academic enrichment. He was involved with the Student Government Association, serving in the Senate body his sophomore year. Outside of school, he has worked as a summer teacher for Horizons, a program for underprivileged students who otherwise wouldn’t have the opportunity to participate in scholastic activities over the summer. For the summer of 2015, he worked for Horizons again and also as a UNCF/Mellon Mays Undergraduate Fellow at Emory University through the Andrew W. Mellon Foundation. There, he completed a comprehensive research prospectus analyzing classical liberal theory in contemporary politics under the guidance of Mellon Mentor Dr. Andrew Douglas, Ph.D. This past summer, he spent 10 weeks at Harvard University through the Mellon Initiative’s Leadership Alliance. He worked in the Data Privacy Lab with Professor Latanya Sweeney, analyzing vulnerabilities in voter registration websites. He is also doing his own theoretical research on analyzing neoliberal ideology, using John Rawls’s Theory of Justice as a comparative lens. For his senior year, he is excited to finish his college debate career and also participate in Moot Court and compete. In addition, he looks forward to expanding his research to analyzing theories from the black radical tradition to further critique neoliberal reason. He is also planning on sharing his research at conferences. He was recently accepted into Yale’s PhD program in political science. He said his most memorable college experience so far was receiving the Beinecke Scholarship to further his graduate studies after he graduates in 2017. Established in 1971 in honor of Edwin, Frederick, and Walter Beinecke, the scholarship provides substantial financial awards to students who show exceptional promise in the areas of humanities and social sciences. He was the only HBCU student to receive the scholarship this year. After receiving his Ph.D., his goal is to become a professor and engage students in intellectual discourse and critical inquiry to help them expand their education. “I want to spend my life in the classroom trying to have an impact on the lives of students, but also being able to engage other intellectual pursuits,” he said. He said the Stamps Scholarship has given him the confidence and platform to grow and succeed.